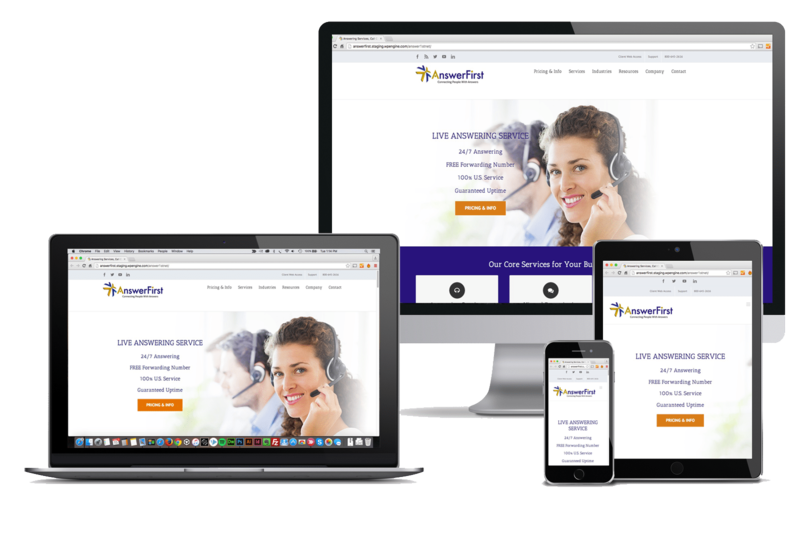 AnswerFirst Communications is a leading provider of first-class phone answering services with expertise across a range of industries including legal, medical, real estate, IT, plumbing, electrical, construction, corporate and more. Their sophisticated technology and unparalleled talent has allowed them to expand their capabilities to answer calls 24 hours a day, 7 days a week with live, dedicated, professional U.S. Customer Service Professionals, ensuring that their customers never miss a call. When AnswerFirst approached ClickFirst with a website redesign project and digital marketing management, AnswerFirst’s website and marketing strategy was outdated, did not emphasize the company’s key strengths, and was not optimized for search engines. Marketing messages on the website, marketing materials and advertisements did not demonstrate AnswerFirst’s exceptional ability to adapt to customer’s’ unique needs and requirements through a wide range of customizable solutions, nor did the site appropriately highlight other key AnswerFirst differentiation factors. With respect to the website’s ability to drive growth in the business, traffic to the website and lead generation from the website were well below the company’s targets. The primary method for visitors to reach the AnswerFirst website included: word of mouth referrals, offline advertising, and unsuccessful online advertisements. 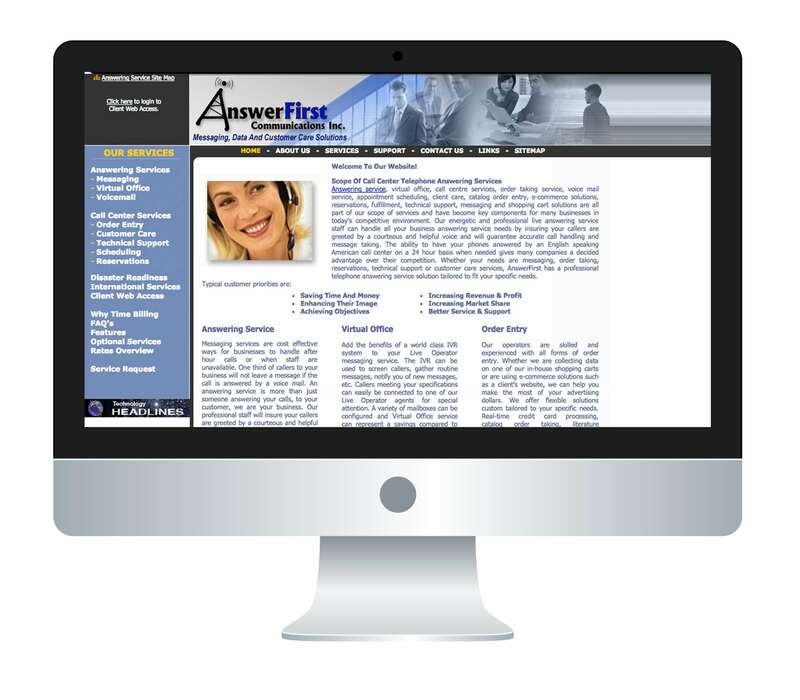 To raise their visibility and generate more leads, AnswerFirst wanted to ensure that prospective customers could easily find the site through organic search and online advertisements that, once on the website, there would be a high likelihood that a site visitor would complete an online form or call AnswerFirst and ask for a consultation and price quote. ClickFirst decided the best way to approach the project was to demonstrate AnswerFirst’s key strengths and differentiation with a re-branding, new website design, and restructured advertising and conversion rate optimization strategy. The solution would feature the company’s top solutions and industries with content that was keyword-specific and relevant to AnswerFirst’s offerings. Additionally, ClickFirst assisted with creating updated content on their website and social media platforms that featured their key services and strengths. On this end, the website showcased full service and industry listings, client case studies, and highlights displaying the level of expertise and knowledge their staff holds. In terms of advertising and lead generation, ClickFirst conducted thorough keyword research to better understand the target audience’s search behavior and preferences, and to determine which keywords would be most advantageous to target. ClickFirst then revamped AnswerFirst’s online advertising copy to ensure the content was in line with the organization’s missions and goals and provided an optimized path to conversion for site visitors.To close the loop on the entire process, ClickFirst focused on assuring that those site visitors converted by regularly performing A/B and multivariant tests on both advertisements and the web pages they led site visitors to. Learn where you can improve your digital marketing with a free detailed analysis.